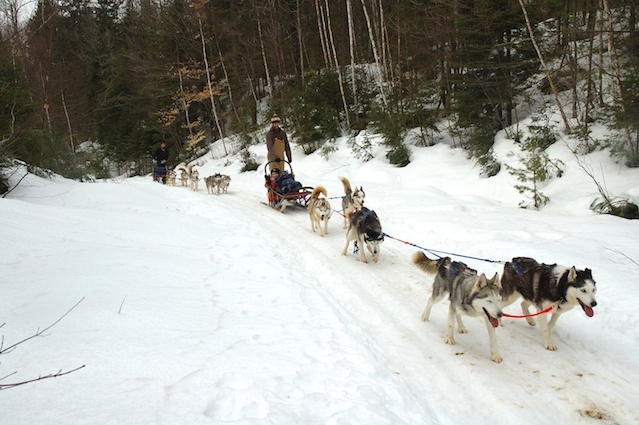 The Sunday Lake Dog Sled Trail is Algonquin Park’s most popular dog sledding trail offering kilometres of mushing through mixed and hardwood forest habitats. This packed route offers spectacular scenery and avoids ice travel. On Highway 60, access is from the Trailer Sanitary Station Parking Lot at km 35.6. Algonquin Park does not offer guided dog sledding opportunities. This service is provided by commercial operators located outside Algonquin Park, who use Algonquin Park’s trail systems. Snow Forest Adventures is a small family run business offering world class dog sledding and canoe expeditions in Algonquin Park, Temagami and Canada’s far north. The incredible passion we have for the dogs, the natural world and the traditional methods of travel, along with the desire to share this passion with others, is truly who we are and why we have chosen this lifestyle. Our trips range in length from a half day to ten days. Drive your own team of loveable Alaskan Huskies and stay in the comfort of heated prospector tents, while enjoying wholesome homemade meals. With over twenty years of experience in leading wilderness expeditions by dog sled and canoe, Snow Forest Adventures commits itself to delivering high quality and personalized wilderness experiences. Whether on the back of a dog sled, or in the stern of a canoe, we and our guides strive to make our client experiences an unforgettable adventure of a lifetime. Come and join us for a truly Canadian Wilderness experience that will never be forgotten! Dogsledding in Haliburton, Ontario’s spectacular winter wilderness, offers a glimpse into a time gone by, when life was slower and people were as one with the natural world around them. Winterdance offers various dogsledding packages with our beautiful Purebred Siberian Huskies to allow people to step back in time. Your dog team will come completely outfitted with all food & beverages provided on 1/2 & full day trips and moonlite tours. All the sleds are 5 foot wooden basket style, with cushions on the bottom and back making for a very comfortable ride and warm, snuggly fleece blankets are provided for extra warmth. Simply choose a dogsledding tour and let us introduce you to an amazing adventure! Our dog sledding trips book up quickly, especially on weekends so advance reservations are highly recommended. Haliburton Forest & Wild Life Reserve Ltd consists of 80.000 acres of forested, rolling hills interspersed with more than 50 lakes and hundreds of wetlands. Winding through the forest are more than 300 kilometers of groomed trails making this a dogsledder’s paradise. Hidden along the trails are a number of small camps and shelters providing scenic locations to have a snack, warm up or stay overnight. North Ridge Ranch is Huntsville’s dogsledding adventure destination. We offer one hour and half day tours through the rugged forests of Muskoka. All tours start with a lesson so that customers can be well informed and confident in their abilities to mush their team. You will enjoy the beauty of the Muskoka wilderness as you drive your team through a winter wonderland of forests on bush and multi-use trails. At the midway point the tour stops for a break where hot chocolate and granola bars are served up for the guests (half day tour only) and there is an opportunity to pet the dogs and take some pictures. Come and unleash your adventure with us. Advanced reservations are required.